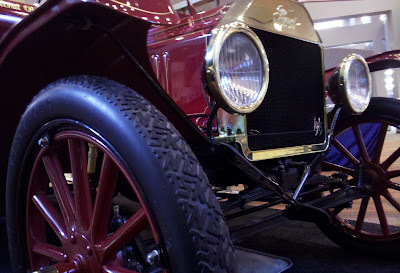 The traveling auto show finally made it's way to Columbus, Ohio. It has become one of my favorite events of the year. Let's get to my highlights. Technology has always been something that automakers have pushed. In the past it may have had a more mechanical lean, but over the past decade or so it is electrical. More specifically feature ridden computer gadgets. This year is no different. I picked up every printed brochure I could find because an auto show is a fit and finish thing. It's about look and advertising. The car makers have to make their point efficiently because of the environment; the world's coolest car lot. One note here: Hyundai had the best swag bag to carry all the swag. I choose Ford because the brochure they had there was fatter then others and 50% of the ink and paper was used for the features above. "We're putting more surprising and innovative new features on the road than ever before. So many, we can't even cover them all here. Drive one. You'll understand." Funny. Ford also has a depressing graphical feature in their EV's. That's "Electric Vehicles". Most of the dash in those cars are LCD. On the far right they have a cluster of leaves. "Watch your forest grow. Stomp on the gas: See it fade." To say Ford is throwing the most darts in regards to features is an understatement. I know that Ford, historically, does this their way but it doesn't make sense to me that an electric car is overloaded with electrical devices and features. Wouldn't you want less drawing from that battery? Lots of picking on Ford here, which is unfair. I have great respect for Ford and its history. Including surviving the government bailout last year. One distinction that Ford can now officially put on its mantle is this; "Buttercup Approved Vehicle" or BAV. This distinction goes to the Ford Flex. 2nd year in a row for this car.